Citizens Bank is a good option if you are well versed in home equity products and have a good idea what you are specifically looking for. However, their inconsistent customer service made getting information relative to specific needs difficult. Citizens Bank lets you use your second home as collateral on your equity loan or line of credit. The home equity loans and home equity lines of credit offered by Citizens Bank are comparable to those of other lenders. Additionally, their rates and fees are also about average. However, poor customer service means that Citzens Bank places out of the top lenders we reviewed. Citizens Bank scores very well compared to other lenders when it comes to rates and fees. They had the second highest value score out of the lenders we reviewed. Additionally, Citzens Bank scores well in terms of fees for things like applying, closing costs, and early payoff. Consequentially, they are one of the best lenders when measured purely in economic terms. 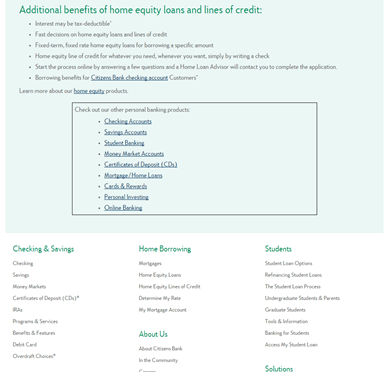 The eligibility requirements for a Citizens Bank home equity loan or home equity line of credit are broadly similar to those of other lenders. We based this comparison on a combination of the amount of equity required to obtain a loan, the loan-to-value ratio, debt-to-income ratio, and credit score requirements. One advantage that Citizens Bank offers is the ability to use a second home as collateral for your loan. Evaluating loan requirements can be a difficult task. We take into account the minimum and maximum value of the loan, repayment periods offered, early payoff fees, and other factors. Citizens Bank does not rank as well as some of the other lenders that we reviewed because their home equity loans have a lower maximum repayment time than many of the other lenders we reviewed. A lower maximum repayment period means that the monthly payments will be higher for a Citizens Bank loan than if you had a longer time to pay the loan back. Customer experience is an area where Citizens Bank lags behind many of the other lenders. The first issue is that there is no online application. Consequentially, you need to be prepared to go to a physical branch location in order to apply for a loan. The process of obtaining a home equity loan typically takes from 30-60 days, with the money from your loan or line of credit available three days after closing. One negative is that it will take an additional 10 days to receive checks that draw against your home equity line of credit. There are a number of other issues with the application process for Citizens Bank. First, customers have reported that the contact number of the website is wrong. Additionally, the livechat service on the website cannot offer specific answers to questions, and exists only to help with site navigation. Different loan officers behaved inconsistently, some being very patient and others who were outright rude. One thing that had plenty of information, and wasn’t rude in any way, was the Citizens Bank website. The website has a number of helpful tools and information, which will help you understand your qualification requirements, as well as the LTV ratio, and get an idea of what your payments will be. 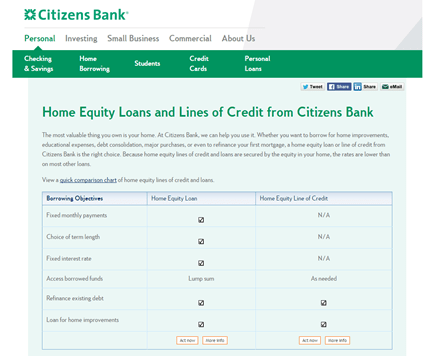 The home equity loans and home equity lines of credit offered by Citizens Bank are on par with other lenders we reviewed. They operate in a number of states, and allow you to use a second home as collateral. However, poor customer service prevent Citizens from making the top of our list, though they are still worth checking out.